If you have young ones returning to school this fall I’m guessing they love spotting a bright yellow school bus. I know mine do! 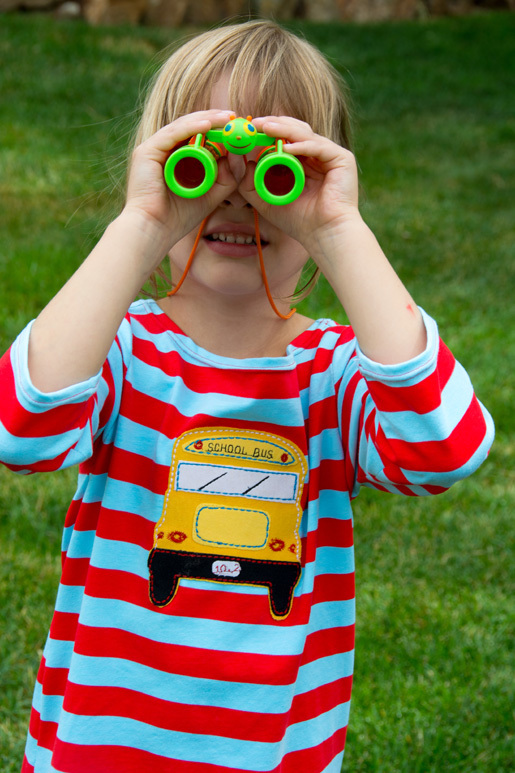 So as I was thinking about a way to make back-to-school clothes fun for my girls I came up with a school bus appliqué for embellishing a basic t-shirt or dress. This fun design would work for boys or girls equally well. The boys might like the extra “gear” of the optional side mirrors included in the template. Sew it onto a simple shirt you’ve sewn or even a purchased cotton shirt. 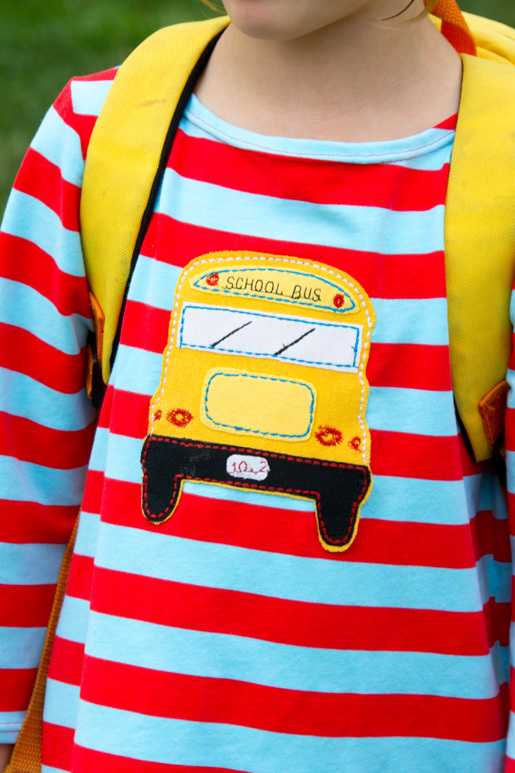 I sewed my own Bateau Neck Dress pattern in a bold stripe and appliqued the school bus on it. 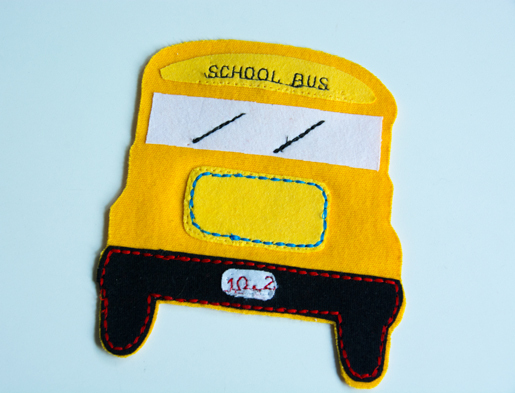 This applique is a great way to create something unique and fun to get your child excited about returning to school. And it’s not too difficult—it just requires a bit of patience. 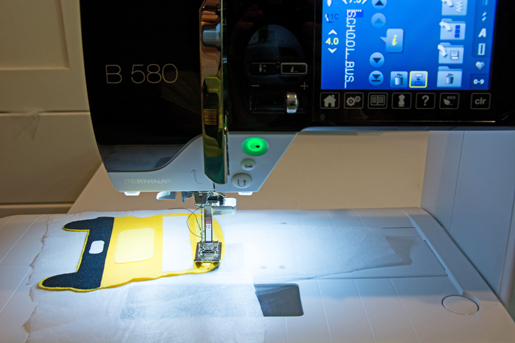 Tip: I like to use fusible webbing to keep everything in place as I stitch, which eliminates all of the stress! 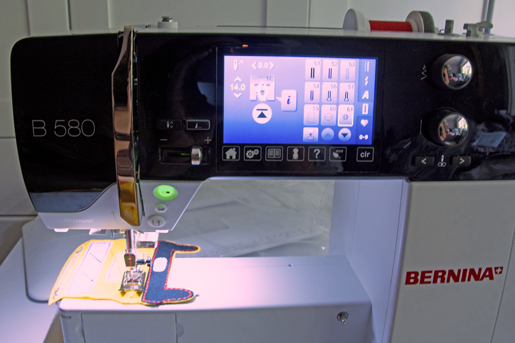 The fun—and art—of applique is experimenting with the right combination of solid and patterned fabrics as well as colored threads. This can take a bit of time but it will pay off in something that looks unique and professional. Because I appliqued a boldly striped t-shirt dress I kept the applique fabrics solid colors but I love mixing prints in appliques too. It’s up to you! Because knit fabrics don’t fray, there is no need to finish the raw edges of any of these pieces. If using woven fabrics a bit of fraying will occur, which I quite like, but the fusible webbing will minimize this. I have found I prefer using different color threads on different pieces within the applique as well as bold stitch patterns. This is subjective—choose a combination that looks good to you. This applique would look great with all one color of thread too! 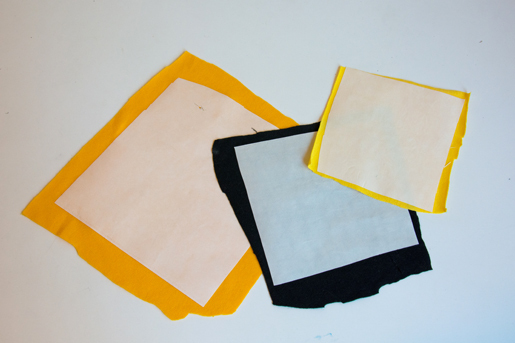 Remember to remove the paper backing before stitching your applique pieces. Start with the smaller pieces on the top of the applique, ironing on and stitching those, and work your way backward to the larger shapes. Step 1) Prepare the appliqué pieces. 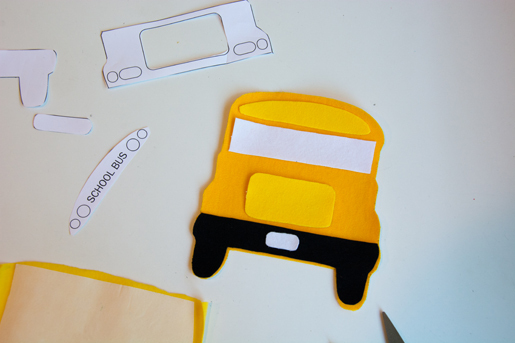 Print and cut out the School Bus template. Start with the largest shapes first, and cut them out of your fabric by tracing around them and then cutting along the lines. Then cut out the smaller shapes in the same manner. Step 2) Create the layered appliqué . To minimize the amount of stitching on the inside of the t-shirt, I like to sew most of the smaller shapes to the bus before sewing it onto the shirt. I would recommend sewing on the “grill” and “School Bus” header. I also sewed on the “tires and bumper” with decorative stitching and later used a regular straight stitch in black to sew it to the t-shirt. Remove the paper packing from the license plate shape, position it on the center of the bumper, and then iron it in place. Then remove the paper backing from the bumper piece and topstitch the license plate to the bumper (use the triple stitch or my favorite, #713 on my BERNINA 580, which resembles hand embroidery). Or you can secure the license plate with a motif or set of numbers or letters as I did. Remove the backing and iron the header onto the school bus piece. Iron on the “grill” piece. Iron on the “windshield” piece. 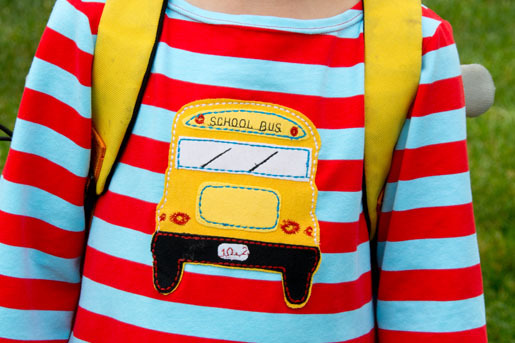 Stitch or embroider “SCHOOL BUS” in the center of the header piece if desired. 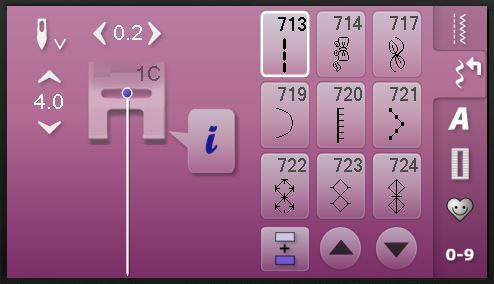 I used a sans serif embroidery alphabet in the smaller size with the stitch width set at 7.5 and the stitch length set at 4.0. I strongly recommend that you experiment with this first on scrap fabric. Fine tune the size of the lettering before doing the final work on your applique. Then use a topstitch to outline the header piece. Top stitch around the “grill” piece. Top stitch on the “windshield” piece. Don’t forget to stitch the “windshield wipers.” I used the triple stitch for this. Topstitch the “red lights” on the header and above the bumper on either side of the grill. I used an eyelet stitch (#61 on my BERNINA 580) at a 4.9 width and 4.9 length for the small “red lights” and a 9.0 width and 14.0 length for the larger red lights. (Note that you’ll need a 9mm stitch plate and foot for this width to work!) Alternatives to this would be to sew on mini pom-poms for the lights, or hand- or machine-embroider circles using a satin stitch, or applique small circles of fabric, perhaps with an “x” formed by straight stitching. Step 3) Stitch the appliqué to the shirt. 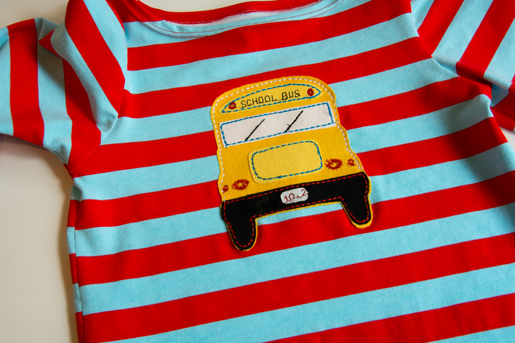 Now that all the smaller pieces are secured to your larger bus shape, position the bus appliqué on your t-shirt or dress and iron it in place. Then use a topstitch to secure the bus to the garment. If you are using the optional side mirrors included in this template, iron them in place last and then topstitch around the edges. Sit back and admire your work! And just wait until your child sees it: All smiles!